This week Wit’s End Artistic Director Cecilia Cackley interviewed artist Amelia Gossman about her experience working as an illustrator on Malevolent Creatures, our upcoming project based on British and Celtic folklore. Cecilia Cackley: When did you first learn about the character of Black Annis (aka Black Agnes)? What drew you to her? Amelia Gossman: As a kid, I was really into folklore and faeries. My best friend and I would look at Brain Froud books when we were eight and run around the woods looking for and trying to lure the creatures we read about. I believe in his book, “Good Faeries/ Bad Faeries” he gives a brief description of her. For my senior thesis in college, I wrote an analysis of Welsh/English folklore and I learned more about her in depth. I chose to write about her because bot only is her back story is really interesting, the added creepiness of cannibalism makes her, for me, one of the scariest creatures. And being scary is intriguing. CC: I know you did a project on her in art school. Can you describe it and talk a little about what it entailed? 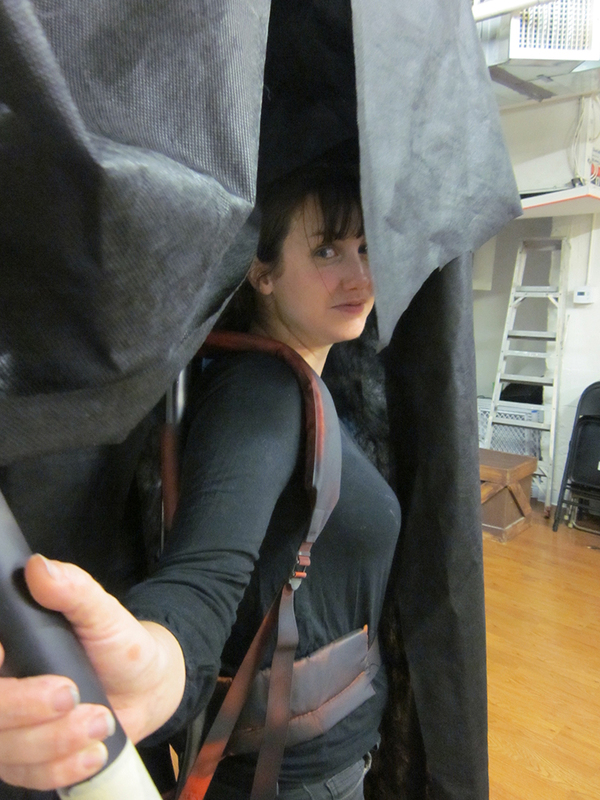 Amy getting set with the rehearsal puppet of Black Annis. Photo by Patricia Germann. CC: What was the most interesting thing you learned about Black Annis in your research? AG: Here’s an excerpt of the paper [that I wrote] that focused on her! The Scots also believe in Wicked Wichts of the Unseelie Court. These bogies were fearsome and inflicted many ills upon both man and beast. They were much more malevolent than the mischievous house spirits. Devilish monsters like Black Agnes would prey upon children. A hag of the Dane Hills near Leicester, England is a blue-faced crone with long claws and yellow fangs, sometimes taking the shape of a cat-demon. She is said to live inside of a cave she personally clawed out from the rocks. She eats the children who stray into the Dane Hills after dark, skinning them and devouring them, later scattering their bones around the hills and hanging their skins from the trees to dry. If children are in short supply, she snatches lambs from the pasture or even babies from the open windows of houses. I think her connection to cats was incredibly interesting. It’s not mentioned in the paper, but I remember reading about how a nearby town, lead by its mayor, would drag a dead cat through out the woods near her cave – I think as a warning to her. That’s a great example of folklore being incredibly ensconced in a town’s culture! I should’ve added that! CC: Did you approach the illustration for us differently than for your school project? AG: Definitely – while I had done research on her, I was able to add some of my own personal ideas to the illustration. I chose to add scarring to her mouth, her large hands and long body, and her ominous clothing – including a crown of bones. I liked having that freedom. CC: What was it like seeing the rehearsal puppet based on your illustration? AG: Amazing!! She had such a spooky presence because she was so large. I think I had an idea that the show would be almost Punch and Judy scale, and that she might be a little marionette, but I was thrilled to see that she was enormous! CC: Was there anything unexpected or surprising about what you saw in the rehearsals for Malevolent Creatures? AG: The integration of the audience and the performance was really cool, something I haven’t seen before. I don’t want to give too much away, but I liked thinking I would see a traditional show and being surprised by unexpected visitors. The performers are so talented and the puppets came to life, even though they weren’t finished. It was great! 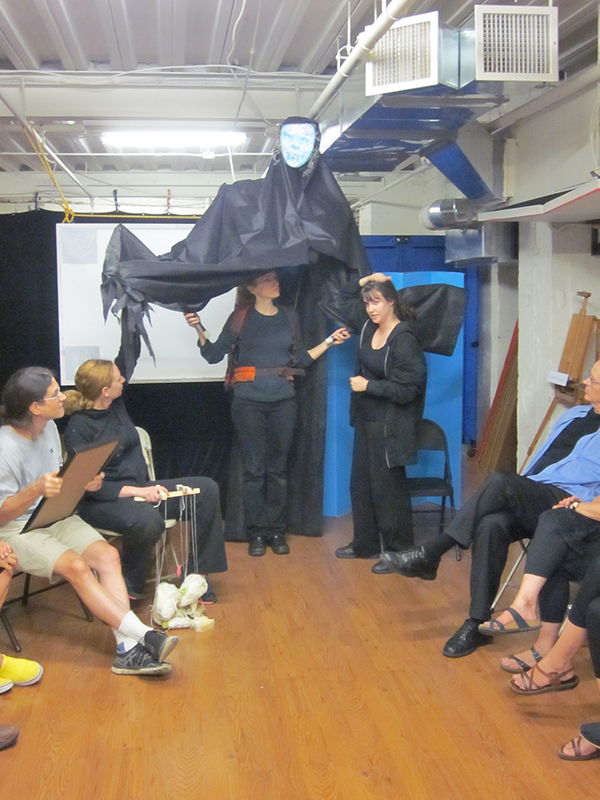 Carol and Amy demonstrating with the Black Annis rehearsal puppet. Photo by Patricia Germann. CC: Are there any other folklore characters you think you’d like to illustrate or write about? AG: Oh gosh, where do I begin?? I’ve used a lot of creatures in my work in the past (especially fauns, but those are Greek rather than English!). However I would love to illustrate more selkies, will-o-the-wisps, and kelpies. The Wit’s End project Malevolent Creatures is currently in development for Fall 2015. Get the latest updates by joining our mailing list or connecting with us on Facebook and Twitter. 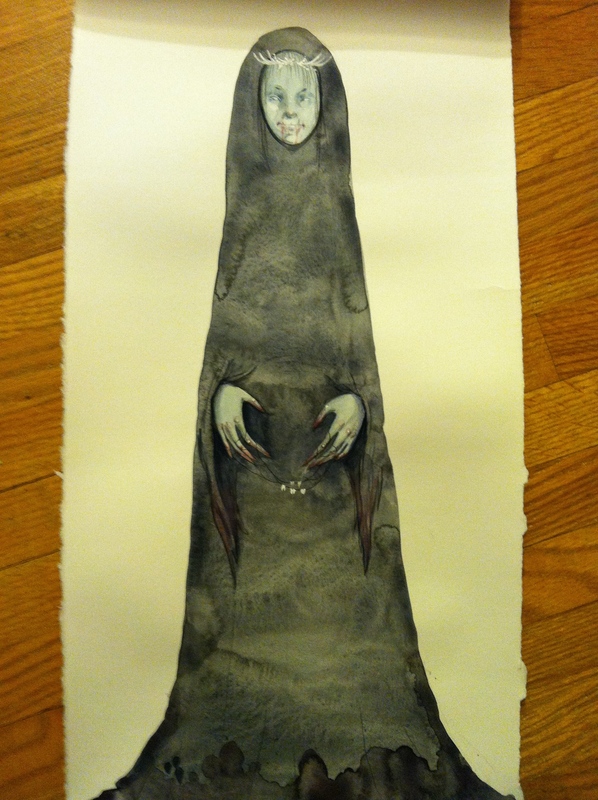 This entry was posted in Inspiration, Puppet Building and tagged Amelia Gossman, Black Annis, British folklore, devised theater, inspiration, Malevolent Creatures, original artwork, puppet building, rehearsal puppet by ccbooks. Bookmark the permalink.